Hill House 1 was designed with the use of the 4 elements - earth, air, fire and water. Feng Shui principles were used extensively in the design and this has resulted in a striking fusion of Asian and contemporary design principles. The property had a change of ownership during construction. A large cantilevered roof extends over the upper balcony. Along with a handrail these items work to frame the view to the city in the distance. 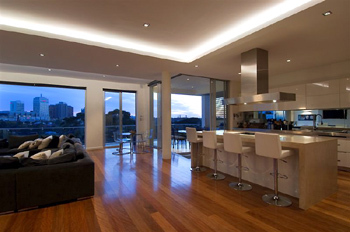 Colours used are luxurious befitting of a 6 (split) level house. The zinc roof returns on its underside as a finished eave so it can be enjoyed from the inside through the high level glazing. 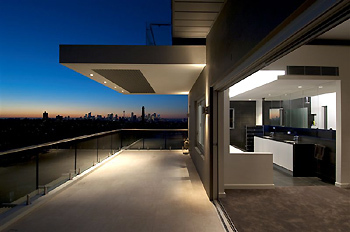 The cantilevered roof extends and salutes the views. 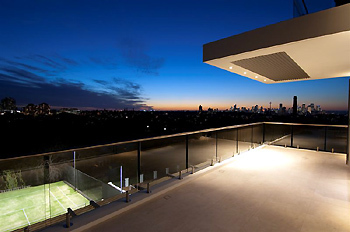 Frameless glass balustrades allow uninterrupted vision to the tennis court below. The sun shading provides filtered light, even at night where it filters the carefully placed external lighting to achieve this effect. The circular stair connects both living levels to each other. 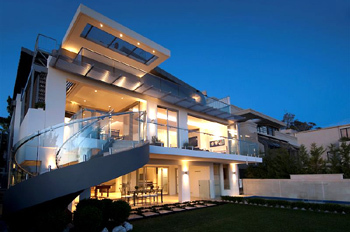 The design of this was intricate and perfectly offsets against the rectilinear formal layout of the house. 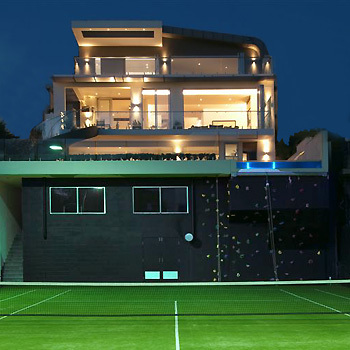 The house includes a full size lighted tennis court, pool with glass panels and a climbing wall. 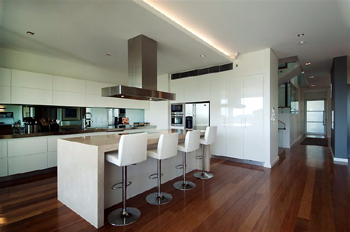 The large contemporary kitchen has all conveniences including polished stone, mirror splashbacks and concealed cupboards, all framed by a recessed lighted bulkhead above. 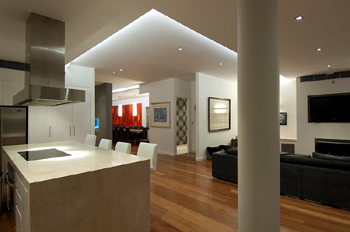 The house makes extensive use of recessed bulkheads with LED lighting. This creates soft lighting effects throughout and helps to delineate areas. The open plan nature of the house is refined by the use of the carefully designed location of internal walls to help separate areas yet link them seamlessly. 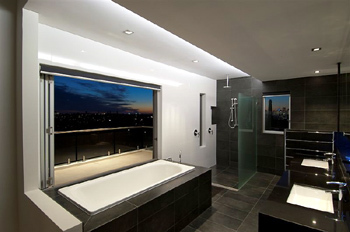 The main ensuite is luxurious in finishes, lighting, detail and size, complete with views without compromising privacy. 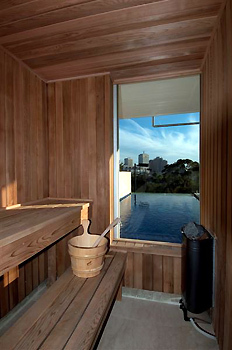 The sauna, finished in western red cedar has regional views and overlooks the pool. Site features: large block of land descends from the street. 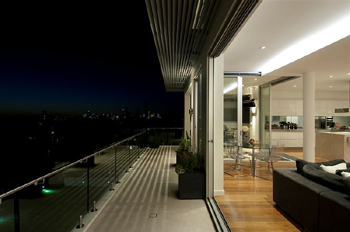 Expansive views of city and suburban areas. 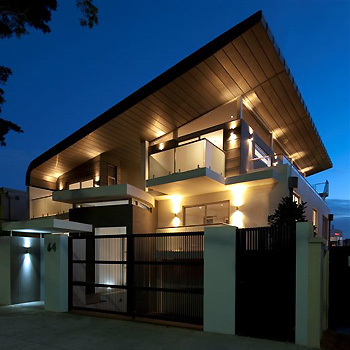 Highlights: Zinc roof, open plan design in a large house complete with discreet areas. The change of ownership during construction resulted in changes to the original design and resulted in additional challenges.